America’s pastime is in the middle of a paradigm shift. 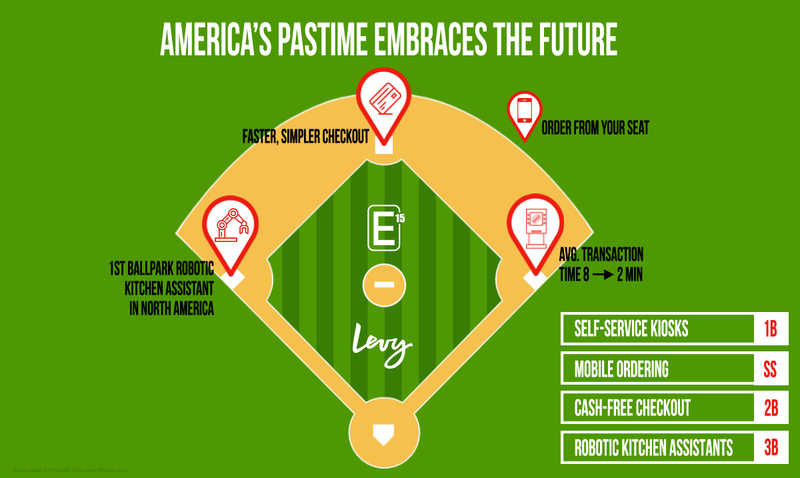 On and off the field, things are changing in the game of baseball, from shorter playing times and more back-and-forth action on the field, to cash-free ballparks and robotic kitchen assistants. As one of the most innovative companies in food and sports, Levy is always looking for ways to enhance the fan experience. Working with our technology and analytics group, E15 Group, we’ve been identifying trends that address fans’ needs and wants while still respecting the history and nostalgia of baseball, and have been bringing those trends to ballparks across the country. Since we’re talking baseball, it is only fitting that we take you around the diamond, trend by trend. Self-service kiosks have become part of everyday life for most baseball fans, appearing in places like banks, hospitals, restaurants, grocery stores, pharmacies, airports, and hotels. The convenience and speed of transactions that fans have become accustomed to is now part of their game day experience as well. These kiosks give fans more control over their orders, selecting the exact items they’d like from the digital menus – no mishearing or repeating of orders anymore ­– which in turn, increases speed of service and reduces transaction times. Over the past three years, Wrigley Field has expanded its concessions menu while increasing points of sale by nearly 37%. Ongoing renovations also led to overall faster service – some stands decreased transaction times by 20% last season compared to 2017. For the 2019 season, 20 self-service kiosks will be placed around the stadium to further reduce transaction times. Last season, 22 self-service kiosks were tested across concession stands in Tropicana Field. Pilot testing found the kiosks significantly reduced transaction times at high-volume stands serving classic stadium fare. During one high attendance series last season, stands with kiosks brought transaction times down from 8 minutes to about 2 minutes, from the time fans touched the screen to when they received their order. This season, the stadium’s premium field boxes will sport self-service kiosks, expanding the menu choices for fans sitting in an area with great views, but tricky foodservice logistics. The kiosks pull in options from several of the stadium’s more elevated concessions concepts – from pulled pork nachos and BBQ sliders to fresh seafood – and Levy team members deliver the orders to the guests directly. If there’s something you want to eat these days, there’s a very good chance you can order it straight from your phone. Apps like Grubhub, Seamless, Uber Eats, and Starbucks have changed the way we order food and drinks while we’re out and about, and now baseball fans can use that same technology to enjoy dishes from local restaurants right in the ballpark. Fans can order through apps like Caviar right from their seats, selecting from local restaurants operating out of a designated concession stand in the ballpark. And depending on the ballpark, the fans will have their food delivered to them in-seat, or they can head to a specified pick-up location in the ballpark. The faster lines move at ballparks, the happier fans are (game results notwithstanding). By removing the element of cash, transactions are streamlined and simplified, speeding everything up. Fans no longer have to wait for change to be counted, they don’t have to carry that change around for the rest of the game, and card transactions are much more secure – reducing the risk of theft. Tropicana Field’s concessions, team stores, box office, and all other points of sale will operate cash-free in 2019. The move follows extensive pilot testing engineered and led by E15 Group at Tropicana Field and venues nationwide to measure the effects of cash-free transactions. Compared to traditional points of sale, tests found cash-free environments can cut average transaction times in half. Concession stands and retail stores inside the ballpark accept major credit cards, Rays gift cards, NFC mobile payments such as Apple Pay and Samsung Pay, and Rays Season Ticket Holder Cards. Cash can be exchanged for gift cards in any amount at all retail locations and in $10 or $20 increments through roaming gift card vendors. Nationals Park has steadily increased its cash-free footprint to meet rising demand. Cash payments account for only about 25% of food and beverage sales throughout the ballpark, so the venue, E15 Group, and Levy have introduced several enhancements this season to accommodate easier card and mobile transactions. 30 food and beverage hawkers throughout venue will now have card readers to accept credit and debit cards for in-seat transactions. The stadium has nearly doubled the number of cash-free points of sale compared to last season, as well as introduced several new self-service kiosks. Robots are all the rage these days, from self-driving cars and robotic surgeons, to drones and kitchen assistants, they’re everywhere. Robots and sports venues may seem like an unlikely pairing at first, but robotic kitchen assistants are pivotal in continuing to shift the game day experience in positive directions for both fans and ballpark employees. Robotic kitchen assistants create a more consistent product, so fans can expect high-quality preparation every time they order. Consistent cooking also means more precise output based on demand during peak times, and reduced food waste as robotic kitchen assistants cook with precision, eliminating over- and under-cooked food. These robots also create a safer kitchen workspace, pulling employees away from hot oil and fryers that can be dangerous and giving them more opportunities to grow in strategic fan-focused roles. In 2018, the Los Angeles Dodgers teamed up with Levy, E15 Group, and Miso Robotics to trial the first robotic kitchen assistant in a North American sports venue. The robotic kitchen assistant worked alongside stadium employees to cook and serve fresh chicken tenders. During the 2018 World Series, demand at some Dodger Stadium concession stands soared as much as 70% compared to a regular-season game. The robotic kitchen assistant simultaneously operated four deep fryers, resulting in faster food throughput, even during peak World Series hours.